Credit: University of Georgia at Athens. The powerful gene editing tool CRISPR is all the rage right now. In the future, scientists hope to use this technology to remove malaria from mosquitoes, treat HIV and Alzheimer’s, develop new drugs, and even to create plastics by modifying yeast so that it transforms sugars into hydrocarbons. However, CRISPR (which stands for ‘Clustered Regularly Interspaced Short Palindromic Repeats’) didn’t seem to work on lizards and snakes. But researchers at the University of Georgia in Athens thought outside the box egg and devised a workaround that finally brings the mighty gene editing tool to the worlds of reptiles. CRISPR-Cas9 allows scientists to alter the DNA of different organisms with high speed and precision. It essentially works by injecting a living organism with a DNA construct composed of the Cas9 enzyme that cuts or deletes a segment of DNA, a sequence of RNA that guides the Cas9 to the correct location to cut, and a new DNA template that repairs the cut and alters the gene. Before CRISPR entered the picture, gene editing a time-consuming and laborious procedure that often ended in failure. “CRISPR-Cas9 mediated gene editing has enabled the direct manipulation of gene function in many species. 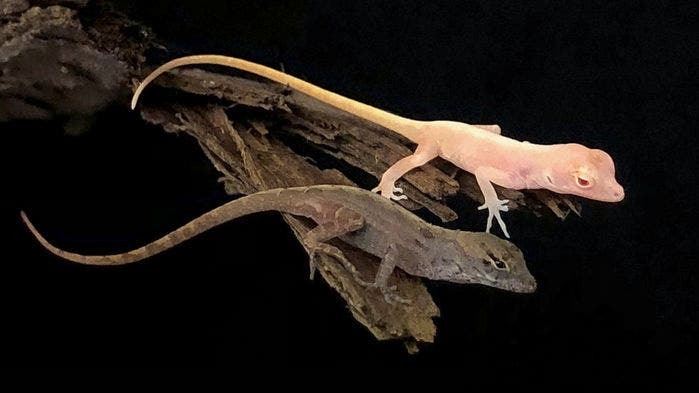 However, the reproductive biology of reptiles presents unique barriers for the use of this technology, and there are currently no reptiles with effective methods for targeted mutagenesis,” the authors wrote. Typically, researchers edit the genes of an organism by injecting the DNA construct into a single-celled fertilized egg, thus leading to a genomic alteration that is present in all subsequent cells. This approach, however, doesn’t work on female anoles, which store sperm in their oviducts for long periods of time. This makes it virtually impossible to properly time CRISPR injection to fertilization. What’s more, the females also form eggshells at fertilization and inserting a needle at this point can damage the embryo. The researchers at the University of Georgia solved this challenge by inserting the CRISPR complex into unfertilized eggs still in the ovaries. For their experiment, the authors targetted a gene that produces an enzyme that controls pigmentation. The team altered a total of 146 immature eggs from 21 lizards, resulting in the breeding of four albino offspring. Scientists claim that the new method should work for other species of lizard as well as snakes, making it a true game-changer in the field. The results were posted in the preprint server bioRxiv.